LinkedIn, the mouth of the working world has launched a dashboard showing how the post of a publisher is performing over the platform. The feature will allow the publisher to have a deep look of the whole analytics for their post like number of views, likes & comments, shares and all those individual profiles that interacted with the post. 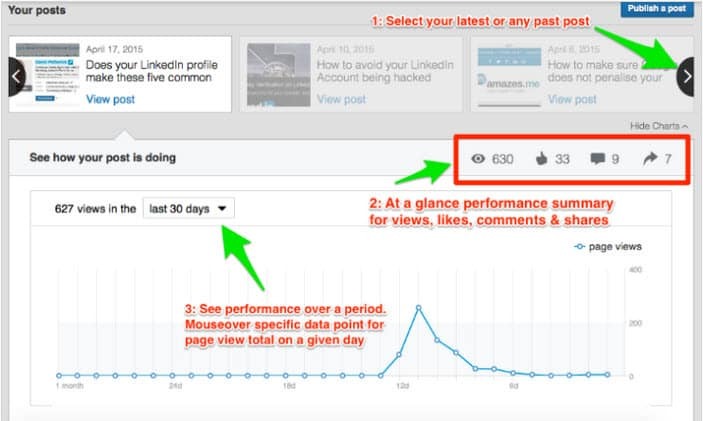 The entire person using LinkedIn might be familiar with the keywords like “who viewed your profile, notifications, messages etc.” Now the addition of the analytics will provide a service to check “who viewed your post”. This tool will allow publisher to check the details of the posts of the past 6 months. However this duration may extend for the premium users and the users can check the stats for the post beyond 6 months. The main reason that we think for extending the feature is to give a hike to the posts over the platform and to raise the traffic to the website. If you publish a piece of content on LinkedIn, you can now get the detailed information for how your content is performing. The dashboard includes various fields of readers based on their geography, industry, job title, and traffic source. The advanced feature provided will encourage the publishers to post more content over the platform and for marketers, the deeper insight could lead to stronger relationships with followers and new sales leads.